Jared S. Colton is an assistant professor at Utah State University. Steve Holmes is an assistant professor at George Mason University. Josephine Walwema is an associate professor at Oakland University. 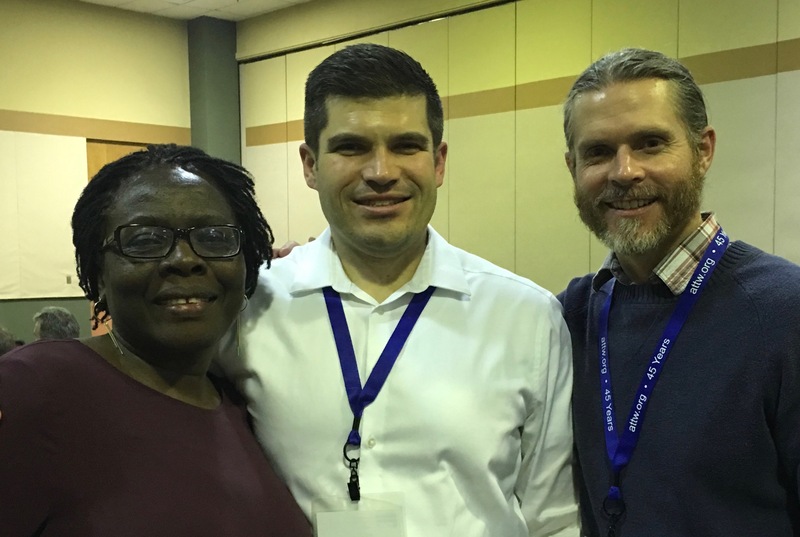 Josephine Walwema, Steve Holmes, and Jared Colton at the 2018 ATTW 21st Conference Awards Reception in Kansas City, KS on March 13. Ashley Rose Mehlenbacher is an assistant professor at University of Waterloo. The ATTW 2018 Conference is just 10 days away! Check out a preview of the ATTW 2018 Conference program! ATTW is pleased to announce the recipients of the 2018 ATTW Graduate Research Awards. In our commitment to advancing graduate students in the field, the award’s purpose is to support and advance the research of graduate students in the latter stages of their PhD programs. The Graduate Research Award recipients will present on their work at a panel at the ATTW Conference on Wednesday, March 14, 2018, Session D2, at 10:45 AM in Kansas City, KS. The award selection committee was really impressed with the quality and potential contributions of these research projects as well as the others submitted. Award recipients will be featured and present their research in a panel at the annual ATTW conference, which will be held on March 13-14, 2018, in Kansas City, KS. We are pleased to share the preliminary schedule and program for the ATTW 2018 Conference in Kansas City, KS at this link: http://attw.org/conference/schedule. We are excited that this year our conference is a full 2-day event, hosted on Tuesday, March 13 and Wednesday, March 14th at the Reardon Convention Center. Concurrent panels will take place on both days. In addition, our first-ever plenary panel will take place during a dedicated session (no concurrent sessions) on Wednesday, March 14th at 9am. At this time, we are unable to make any major changes to the schedule (including accommodating requests for presentations on specific days). But please help us double-check the accuracy of your information and that of co-presenters’, if applicable (email bscott@ucf.edu with any corrections). We are looking forward to seeing you in Kansas City, KS! Thank you for your support of ATTW. On behalf of the ATTW Executive Committee, I’m excited to announce a new award that will be given for the first time at ATTW 2018 in Kansas City, Kansas. If you are graduate student or non tenure-track faculty member who has been accepted to present at ATTW 2018, please read below to see if you are eligible for this award. Applications are due by January 30, 2018. As part of ATTW’s commitment to social justice practices and increasing organizational participation and supporting research from underrepresented scholars and teachers of technical communication, ATTW is offering three awards to recognize and amplify the important contributions of underrepresented students and/or non-tenure track faculty presenting at ATTW 2018 in Kansas City, Kansas. The award includes a conference registration waiver and financial assistance ($500) with the costs of traveling to ATTW 2018. Award recipients will be honored at the ATTW awards reception. Applications should be submitted to http://attw.submittable.com by 11:59 PM PST, January 30, 2018. Cheryl Geisler, Simon Fraser University, on Coding Language Reliably. These two half-day workshops will be held in The Reardon Convention Center in Kansas City, Kansas on Tuesday afternoon, March 13, 1:30-5:30. This is the first day of the ATTW conference (March 13-14) and the day before the CCCC conference (March 14-17). The deadline for applications has been extended January 30, 2018 and acceptances will be emailed to you by Feb 2. As we look forward to celebrating the 45th anniversary of ATTW this March 13-14 in Kansas City, Kansas, the ATTW executive committee wanted to take a moment to thank its members for their participation in the ATTW community. Because of your continuing support as members of ATTW, we will host a two-day conference that supports diverse scholarship and several opportunities for professional development, offer conference funding opportunities for graduate students to showcase their research, sponsor scholarships to the Research Methods Workshops so students can continue to find mentors and develop their work, and recognize and amplify the important contributions of underrepresented students and/or non-tenure track faculty within technical communication presenting at ATTW 2018. I think it’s an exciting time to be a member of ATTW! Please check your membership status since we’ll be electing new members to the Executive Committee in February. If you’re not currently an ATTW member, or you haven’t already renewed your membership for 2018, please be sure to do so as soon as possible because ballots will be emailed to current ATTW members mid-February in order to elect a vice-president and three members-at-large in time for the conference. Joining or renewing your membership in ATTW is linked to subscribing or renewing your subscription to Technical Communication Quarterly. Check out the membership page of the ATTW website for instructions on how to join or renew your ATTW membership. ATTW members who would like to check the status of their membership may do so by accessing the Taylor & Francis Access Entitlements page but this requires a prior login username and password. I look forward to seeing many of you in March as we convene for our annual conference. Thanks!